Timeless and elegant, this stunning solitaire ring mixes classic sophistication with glamorous sparkle. Crafted in 9ct yellow gold, this beautiful ring has a shimmering round cubic zirconia at its centre, and is finished with more glittering cubic zirconias set into the shoulders for extra sparkle. 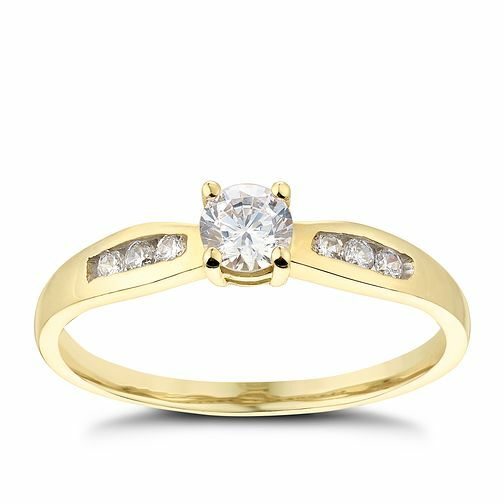 9ct Yellow Gold Cubic Zirconia Solitaire Ring is rated 4.7 out of 5 by 3. Rated 4 out of 5 by Anonymous from Fantastic piece of jewelry, elegant and eye catching for a good price. This was bought for my girlfriend for her birthday, she was so happy with it and is complimented about the ring on a daily basis.